Tanzania holds the enviable blend of beautifully idyllic beaches, fascinating culture, moss-covered ruins and wonderfully friendly people. But perhaps most notable upon your arrival is that this is the true land of safari. Here you will find thousands of wildebeest stampeding across the Serengeti plains paired by mighty hippos wallowing in the wild and beautiful surrounds of Katavi National Park. See herds of elephants trudging through Tarangire National Park on their seasonal migration routes. Revel as you spot chimpanzees glide their way through the treetops in the verdant Mahale Mountains. From stepping aboard your private helicopter, next stop will be the lush grounds of your lodge. Whilst here, perhaps you may wish to take a privately chartered boat safari down the Rufiji River in Selous Game Reserve, easing slowly past crocodiles lurking and elephants cavorting on the riverbank. Gaze in awe at giraffes beside ancient Baobab trees whilst enjoying a bespoke bike ride with a famed naturalist as your guide, winding between pairs of zebra as they graze placidly along your route. Sit in absolute silence, holding your breath as a lioness with cubs make their way alongside your tracks in the epic Ngorongoro Crater - one of the largest calderas in the world. Within the 22km-wide basin you will see buffalo, lions, elephants and flamingos, perhaps even coming across a black rhino or two if luck is on your side. With a cinematographer guide on hand to lead the way, little will be missed in the way of capturing the wondrous topography and wildlife on film as keepsake mementos of your incredible time here. Adding an extra element to the experience, take to the skies and film the action from above. Or for something a little different, pick a shady spot and master the art of flying a camera-mounted drone above the action, spotting local Maasai tending to their cattle set amongst a dramatic backdrop. Glide across the plains of the Serengeti, perhaps by hot air balloon for a real sense of peace and calm. Here in nature’s mystery, power and beauty capturing the migration of hundreds of thousands of wildebeest, enraptured by their rhythms of survival as they move at speed in search of fresh grasslands. 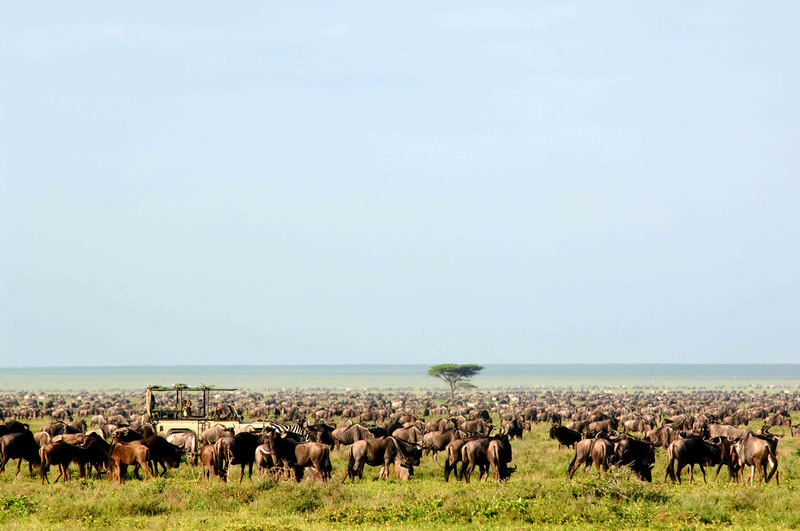 With 1.5 million wildebeest here, this is the Serengeti’s calling card and an event simply never to missed when visiting these lands. As you glide back to Tanzania, back to the realms of quiet and understated luxury, sit and reminisce about your grand adventures, delighting in the experiences and memories you have made, with the sound of roaring lions echoing in your ears, a sound which has grown familiar on your jaunts in the Serengeti. Make a toast to your incredible time here, with plans and dreams to someday return and capture each moment once again. If you would like to discuss your own incredible journey of a lifetime, our Africa specialist Jonny Stage can be reached on +44 203 358 0110 or by email.